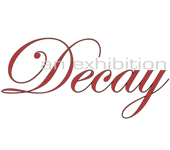 “Decay” presents artworks addressing the ephemeral changes of life and its movement, for reasons of environmental condition, economic variables, and social-political drifts. We live in a time when the force of gravity is not simply physical. It is also cultural and spiritual. With “Decay”, the artists that we have selected have explored urban decay, biological decay, societal decay, physical decay and moral decay. All of the works are reminders that everything that we are attached to is ultimately ephemeral. And, the exhibition is a stark reminder that “Decay” is nature’s change agent. Co-curators, Micaëla van Zwoll and Michael Yochum, selected eight artists with ties to the San Francisco Bay Area. They are each concerned with these ideas of change, its extant deterioration and shift; and they consistently represent those ideas with their work. The eight artists selected are Philip Alden Benn, Sidnea D’Amico, Marie-Lou Desmeules, Chanel Matsunami Govreau, Phillip Hua, Dan Newman, Jenny Robinson and Tim Roseborough. Philip Alden Benn, a recent MFA graduate from the San Francisco Art Institute works with video and directly references his concern with the natural environment. Sidnea D’Amico represents the graffiti bound streets of Sao Paolo with colorfully graphic paintings. Marie-Lou Desmeules’ lascivious, yet tender, subjects taken from Berlin’s nightlife are her canvas and collaborative performances, documented via C-print photography. Chanel Matsunami Govreau is an activist, cross-cultural artist who combines and documents her performance with video. Phillip Hua’s collage paintings are a beautiful commentary, and challenge, to any conservationist, made with often-found materials and memories of travel to China. Dan Newman’s photographic digital work isolate poignant details of abandoned industry; and similarly, award-winning Jenny Robinson’s print work presents reminders of urban environments that remain in constant cycles of decay and renewal. An important member of the Bay Area Digitalist movement, Tim Roseborough’s work is informed by the screen culture of his generation; the resulting ambiguities and changes created in language are the foundation of his design of Englyph. During the course of our curatorial journey, we discovered ideas that beautifully represent environmental concerns, moral and urban decay, and changes to societal structure, that, while seemingly representing facile images of degradation, concurrently illustrate a synchronous shift of accepted conventions. We are fascinated by the visual voice of each artist, and are excited to introduce their work to you. - Micaëla van Zwoll is an independent curator and art consultant. Widely educated and traveled, she describes herself as cultured and independent. She owned and directed Micaëla Gallery from 1996 through 2011, and currently resides in the San Francisco Bay Area. - Michael Yochum is one of the co-founders of Arc Studios and Gallery. Arc is a community-oriented arts organization that seeks to support and encourage emerging and mid-career artists. While the gallery does not exhibit solely local Bay Area artists, there is a definite focus on providing exhibition opportunities for local artists. Six of the eight artists in this exhibition live and work in the Bay Area. Michael was educated in New England, Tokyo and New York City. His under-graduate and graduate studies were in art history. He has been heavily involved in supporting local art and artists since 2005; and, he resides in San Francisco.